Pro Class EMP 13-8 Multi Switch 3 Satellite=8 Subscribers HD 4K. The description of this item has been automatically translated. Multiswitch full HDTV UHD 4 K. Quality of the upper class! With the EMP professional class MS13/4 PIÙ 6 of brand EMP-Centauri You can three satellites Positions Z. Astra 19.2 ° E + Hotbird 13,0 ° E + Turksat 42 ° E with up to 3 Quattro LNB Dine on the multi switch and up to eight participants / receivers Digital connect to the outputs of the multiswitch and supply. Participants can see your show independently from each other. The very low loss values and very good signal processing characterize the brand EMP Multiswitches. The EMP Multiswitch is terrestrial back-channel passive fit and it is possible to inject a terrestrial antenna (FM, DAB, DVB-T), cable channels (DVB-C) or monitoring cameras on the TERR input on the Multiswitch. With the knob, you have the possibility to adjust the input signal level of 13 satellite – LNB inputs and the terrestrial 0-15 DB or customize each other. The short circuit proof heavy duty Stromsparnetzteil P3U27 also easily provides the simplest LNB. The Multiswitch is suitable for twin – Quad – Quattro LNB. If necessary you can extend at any time the above multi switch with one our cascade building blocks to further subscriber connections. HDTV / DVB-S 2 / full HD / SKY HD / 3D ready / 4 K UHD. Model: EMP-Centauri MS13 / 8PIU-6. Construction: 13 inputs / 8 outputs of the participants. Reception: 3 satellite, 1 aerial or cable DVB-C. Terrestrial active (gain): Yes. Sat-range active (gain): Yes. Control: DiSEqC 1.0 – 1.1 (2.0) commands. High performance Stromsparnetzteil: P. Suitable for digital (DVB-S): Yes. Suitable for HDTV (DVB-S2): Yes. Twin LNB eligible: Yes. Quad LNB compatible: Yes. Signal strength level control: Yes. Used as a cascade of degree: Yes. Frequency range SAT: 950 2300 MHz. Passive input: 5 862 MHz. Frequency range output active: 40 2300 MHz. Frequency range Terr Input Active: 40 862 MHz. Frequency range output passive: 5 2300 MHz. Loss satellite: avg 0dB. Loss terrestrial: 16dB avg. Decoupling V / H:> 20 dB. Decoupling Low / High:> 20 dB. Isolation sat inputs min. Maximum input signal satellite. Maximum output signal satellite: 85dBµV. Maximum output signal Terr. Power consumption of the receiver: 50 mA at 18V. + 70 ° C. Terrestrial input: 1 F-connector female. Input sat levels: 3 satellite positions = 12 F-female connectors. Receiver outputs: 8 F-female connectors. Short circuit protection: Yes. LNB power output: not specified. Electricity needs from the receiver: 75mA. Power consumption mode active / passive: 6.5 W / 4.5 W + LNB. Internal power supply: P3U27 18 / 12 / 5 V 1000 mA Max. Power supply: 90 265 V AC 50 / 60 Hz. Operating temperature: -30 + 70 ° C. Quality of the upper class Multiswitch! 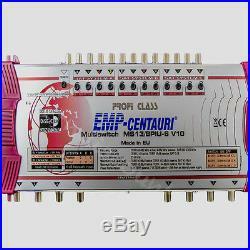 1 x 13-08 multi switch EMP-Centauri ProFi class 4 x screws for wall mounting 4x plugs. 2 x f terminators. 21 x F-plug 7.00 mm. 1x invoice VAT on your name. Check out our other offers. If the offer includes batteries or rechargeable batteries and rechargeable batteries do not belong in household waste. As a consumer you are legally obliged to return used batteries and accumulators. If you wish to exercise the latter option, please send your old batteries postpaid to our address (see below). These signs can be found on batteries containing pollutants and batteries. IPTV & Kartina TV. Austria 13.0 0. Belgium 13.0 0. France 13.0 0. England 13.0 0. Italy 13.0 0. Payments to 14 clock be sent by us on the same day. 4 73110 Hattenhofen T: 0 7164 915 10 16 Inh. We will inform you about our products. Digital DVB-S / S2 Full HDTV UHD 4K Ready. The item “Pro Class EMP 13-8 Multi Switch 3 Satellite=8 Subscribers HD 4K” is in sale since Sunday, February 11, 2018. This item is in the category “Sound & Vision\TV Reception & Set-Top Boxes\Satellite Multiswitchers”. The seller is “sterndiscount” and is located in Göppingen Hattenhofen. This item can be shipped worldwide. Pro Class EMP 13-8 Multi Switch 3 Satellite=8 Subscribers HD 4K. The description of this item has been automatically translated. Multiswitch full HDTV UHD 4 K. Quality of the upper class! With the EMP professional class MS13/4 PIÙ 6 of brand EMP-Centauri You can three satellites Positions Z. Astra 19.2 ° E + Hotbird 13,0 ° E + Turksat 42 ° E with up to 3 Quattro LNB Dine on the multi switch and up to eight participants / receivers Digital connect to the outputs of the multiswitch and supply. Participants can see your show independently from each other. The very low loss values and very good signal processing characterize the brand EMP Multiswitches. The EMP Multiswitch is terrestrial back-channel passive fit and it is possible to inject a terrestrial antenna (FM, DAB, DVB-T), cable channels (DVB-C) or monitoring cameras on the TERR input on the Multiswitch. With the knob, you have the possibility to adjust the input signal level of 13 satellite – LNB inputs and the terrestrial 0-15 DB or customize each other. The short circuit proof heavy duty Stromsparnetzteil P3U27 also easily provides the simplest LNB. The Multiswitch is suitable for twin – Quad – Quattro LNB. If necessary you can extend at any time the above multi switch with one our cascade building blocks to further subscriber connections. HDTV / DVB-S 2 / full HD / SKY HD / 3D ready / 4 K UHD. Model: EMP-Centauri MS13 / 8PIU-6. Construction: 13 inputs / 8 outputs of the participants. Reception: 3 satellite, 1 aerial or cable DVB-C. Terrestrial active (gain): Yes. Sat-range active (gain): Yes. Control: DiSEqC 1.0 – 1.1 (2.0) commands. High performance Stromsparnetzteil: P. Suitable for digital (DVB-S): Yes. Suitable for HDTV (DVB-S2): Yes. Twin LNB eligible: Yes. Quad LNB compatible: Yes. Signal strength level control: Yes. Used as a cascade of degree: Yes. Frequency range SAT: 950 2300 MHz. Passive input: 5 862 MHz. Frequency range output active: 40 2300 MHz. Frequency range Terr Input Active: 40 862 MHz. Frequency range output passive: 5 2300 MHz. Loss satellite: avg 0dB. Loss terrestrial: 16dB avg. Decoupling V / H:> 20 dB. Decoupling Low / High:> 20 dB. Isolation sat inputs min. Maximum input signal satellite. Maximum output signal satellite: 85dBµV. Maximum output signal Terr. Power consumption of the receiver: 50 mA at 18V. + 70 ° C. Terrestrial input: 1 F-connector female. Input sat levels: 3 satellite positions = 12 F-female connectors. Receiver outputs: 8 F-female connectors. Short circuit protection: Yes. LNB power output: not specified. Electricity needs from the receiver: 75mA. Power consumption mode active / passive: 6.5 W / 4.5 W + LNB. Internal power supply: P3U27 18 / 12 / 5 V 1000 mA Max. Power supply: 90 265 V AC 50 / 60 Hz. Operating temperature: -30 + 70 ° C. Quality of the upper class Multiswitch! 1 x 13-08 multi switch EMP-Centauri ProFi class 4 x screws for wall mounting 4x plugs. 2 x f terminators. 21 x F-plug 7.00 mm. 1x invoice VAT on your name. Check out our other offers. If the offer includes batteries or rechargeable batteries and rechargeable batteries do not belong in household waste. As a consumer you are legally obliged to return used batteries and accumulators. If you wish to exercise the latter option, please send your old batteries postpaid to our address (see below). These signs can be found on batteries containing pollutants and batteries. IPTV & Kartina TV. Austria 13.0 0. Belgium 13.0 0. France 13.0 0. England 13.0 0. Italy 13.0 0. Payments to 14 clock be sent by us on the same day. 4 73110 Hattenhofen T: 0 7164 915 10 16 Inh. We will inform you about our products. Digital DVB-S / S2 Full HDTV UHD 4K Ready. The item “Pro Class EMP 13-8 Multi Switch 3 Satellite=8 Subscribers HD 4K” is in sale since Monday, December 04, 2017. This item is in the category “Sound & Vision\TV Reception & Set-Top Boxes\Satellite Multiswitchers”. The seller is “sterndiscount” and is located in Göppingen Hattenhofen. This item can be shipped worldwide. Pro Class EMP 13-8 Multiswitch Multiswitch 3 Satellite=8 Subscriber HD 4K. The description of this item has been automatically translated. Multiswitch full HDTV UHD 4 K. Quality of the upper class! With the EMP professional class MS13/4 PIÙ 6 of brand EMP-Centauri You can three satellites Positions Z. Astra 19.2 ° E + Hotbird 13,0 ° E + Turksat 42 ° E with up to 3 Quattro LNB Dine on the multi switch and up to eight participants / receivers Digital connect to the outputs of the multiswitch and supply. Participants can see your show independently from each other. The very low loss values and very good signal processing characterize the brand EMP Multiswitches. The EMP Multiswitch is terrestrial back-channel passive fit and it is possible to inject a terrestrial antenna (FM, DAB, DVB-T), cable channels (DVB-C) or monitoring cameras on the TERR input on the Multiswitch. With the knob, you have the possibility to adjust the input signal level of 13 satellite – LNB inputs and the terrestrial 0-15 DB or customize each other. The short circuit proof heavy duty Stromsparnetzteil P3U27 also easily provides the simplest LNB. The Multiswitch is suitable for twin – Quad – Quattro LNB. If necessary you can extend at any time the above multi switch with one our cascade building blocks to further subscriber connections. HDTV / DVB-S 2 / full HD / SKY HD / 3D ready / 4 K UHD. Model: EMP-Centauri MS13 / 8PIU-6. Construction: 13 inputs / 8 outputs of the participants. Reception: 3 satellite, 1 aerial or cable DVB-C. Terrestrial active (gain): Yes. Sat-range active (gain): Yes. Control: DiSEqC 1.0 – 1.1 (2.0) commands. High performance Stromsparnetzteil: P. Suitable for digital (DVB-S): Yes. Suitable for HDTV (DVB-S2): Yes. Twin LNB eligible: Yes. Quad LNB compatible: Yes. Signal strength level control: Yes. Used as a cascade of degree: Yes. Frequency range SAT: 950 2300 MHz. Passive input: 5 862 MHz. Frequency range output active: 40 2300 MHz. Frequency range Terr Input Active: 40 862 MHz. Frequency range output passive: 5 2300 MHz. Loss satellite: avg 0dB. Loss terrestrial: 16dB avg. Decoupling V / H:> 20 dB. Decoupling Low / High:> 20 dB. Isolation sat inputs min. Maximum input signal satellite. Maximum output signal satellite: 85dBµV. Maximum output signal Terr. Power consumption of the receiver: 50 mA at 18V. + 70 ° C. Terrestrial input: 1 F-connector female. Input sat levels: 3 satellite positions = 12 F-female connectors. Receiver outputs: 8 F-female connectors. Short circuit protection: Yes. LNB power output: not specified. Electricity needs from the receiver: 75mA. Power consumption mode active / passive: 6.5 W / 4.5 W + LNB. Internal power supply: P3U27 18 / 12 / 5 V 1000 mA Max. Power supply: 90 265 V AC 50 / 60 Hz. Operating temperature: -30 + 70 ° C. Quality of the upper class Multiswitch! 1 x 13-08 multi switch EMP-Centauri ProFi class 4 x screws for wall mounting 4x plugs. 2 x f terminators. 21 x F-plug 7.00 mm. 1x invoice VAT on your name. Check out our other offers. If the offer includes batteries or rechargeable batteries and rechargeable batteries do not belong in household waste. As a consumer you are legally obliged to return used batteries and accumulators. If you wish to exercise the latter option, please send your old batteries postpaid to our address (see below). These signs can be found on batteries containing pollutants and batteries. IPTV & Kartina TV. Austria 13.0 0. Belgium 13.0 0. France 13.0 0. England 13.0 0. Italy 13.0 0. Payments to 14 clock be sent by us on the same day. 4 73110 Hattenhofen T: 0 7164 915 10 16 Inh. We will inform you about our products. Digital DVB-S / S2 Full HDTV UHD 4K Ready. The item “Pro Class EMP 13-8 Multiswitch Multiswitch 3 Satellite=8 Subscriber HD 4K” is in sale since Monday, October 02, 2017. This item is in the category “Sound & Vision\TV Reception & Set-Top Boxes\Satellite Multiswitchers”. The seller is “sterndiscount” and is located in Göppingen Hattenhofen. This item can be shipped worldwide. Pro Class EMP 13-8 Multiswitch Multiswitch 3 Satellite=8 Subscriber HD 4K. The description of this item has been automatically translated. Multiswitch full HDTV UHD 4 K. Quality of the upper class! With the EMP professional class MS13/4 PIÙ 6 of brand EMP-Centauri You can three satellites Positions Z. Astra 19.2 ° E + Hotbird 13,0 ° E + Turksat 42 ° E with up to 3 Quattro LNB Dine on the multi switch and up to eight participants / receivers Digital connect to the outputs of the multiswitch and supply. Participants can see your show independently from each other. 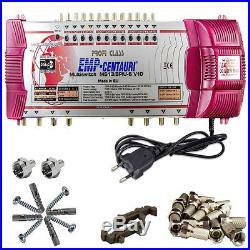 The very low loss values and very good signal processing characterize the brand EMP Multiswitches. The EMP Multiswitch is terrestrial back-channel passive fit and it is possible to inject a terrestrial antenna (FM, DAB, DVB-T), cable channels (DVB-C) or monitoring cameras on the TERR input on the Multiswitch. With the knob, you have the possibility to adjust the input signal level of 13 satellite – LNB inputs and the terrestrial 0-15 DB or customize each other. The short circuit proof heavy duty Stromsparnetzteil P3U27 also easily provides the simplest LNB. The Multiswitch is suitable for twin – Quad – Quattro LNB. If necessary you can extend at any time the above multi switch with one our cascade building blocks to further subscriber connections. HDTV / DVB-S 2 / full HD / SKY HD / 3D ready / 4 K UHD. Model: EMP-Centauri MS13 / 8PIU-6. Construction: 13 inputs / 8 outputs of the participants. Reception: 3 satellite, 1 aerial or cable DVB-C. Terrestrial active (gain): Yes. Sat-range active (gain): Yes. Control: DiSEqC 1.0 – 1.1 (2.0) commands. High performance Stromsparnetzteil: P. Suitable for digital (DVB-S): Yes. Suitable for HDTV (DVB-S2): Yes. Twin LNB eligible: Yes. Quad LNB compatible: Yes. Signal strength level control: Yes. Used as a cascade of degree: Yes. Frequency range SAT: 950 2300 MHz. Passive input: 5 862 MHz. Frequency range output active: 40 2300 MHz. Frequency range Terr Input Active: 40 862 MHz. Frequency range output passive: 5 2300 MHz. Loss satellite: avg 0dB. Loss terrestrial: 16dB avg. Decoupling V / H:> 20 dB. Decoupling Low / High:> 20 dB. Isolation sat inputs min. Maximum input signal satellite. Maximum output signal satellite: 85dBµV. Maximum output signal Terr. Power consumption of the receiver: 50 mA at 18V. + 70 ° C. Terrestrial input: 1 F-connector female. Input sat levels: 3 satellite positions = 12 F-female connectors. Receiver outputs: 8 F-female connectors. Short circuit protection: Yes. LNB power output: not specified. Electricity needs from the receiver: 75mA. Power consumption mode active / passive: 6.5 W / 4.5 W + LNB. Internal power supply: P3U27 18 / 12 / 5 V 1000 mA Max. Power supply: 90 265 V AC 50 / 60 Hz. Operating temperature: -30 + 70 ° C. Quality of the upper class Multiswitch! 1 x 13-08 multi switch EMP-Centauri ProFi class 4 x screws for wall mounting 4x plugs. 2 x f terminators. 21 x F-plug 7.00 mm. 1x invoice VAT on your name. Check out our other offers. If the offer includes batteries or rechargeable batteries and rechargeable batteries do not belong in household waste. As a consumer you are legally obliged to return used batteries and accumulators. If you wish to exercise the latter option, please send your old batteries postpaid to our address (see below). These signs can be found on batteries containing pollutants and batteries. IPTV & Kartina TV. Austria 13.0 0. Belgium 13.0 0. France 13.0 0. England 13.0 0. Italy 13.0 0. Payments to 14 clock be sent by us on the same day. 4 73110 Hattenhofen T: 0 7164 915 10 16 Inh. We will inform you about our products. Digital DVB-S / S2 Full HDTV UHD 4K Ready. The item “Pro Class EMP 13-8 Multiswitch Multiswitch 3 Satellite=8 Subscriber HD 4K” is in sale since Wednesday, August 02, 2017. This item is in the category “Sound & Vision\TV Reception & Set-Top Boxes\Satellite Multiswitchers”. The seller is “sterndiscount” and is located in Göppingen Hattenhofen. This item can be shipped worldwide. Pro Class EMP 13-8 Multiswitch Multiswitch 3 Satellite=8 Subscriber HD 4K. The description of this item has been automatically translated. Multiswitch full HDTV UHD 4 K. Quality of the upper class! With the EMP professional class MS13/4 PIÙ 6 of brand EMP-Centauri You can three satellites Positions Z. Astra 19.2 ° E + Hotbird 13,0 ° E + Turksat 42 ° E with up to 3 Quattro LNB Dine on the multi switch and up to eight participants / receivers Digital connect to the outputs of the multiswitch and supply. Participants can see your show independently from each other. The very low loss values and very good signal processing characterize the brand EMP Multiswitches. The EMP Multiswitch is terrestrial back-channel passive fit and it is possible to inject a terrestrial antenna (FM, DAB, DVB-T), cable channels (DVB-C) or monitoring cameras on the TERR input on the Multiswitch. With the knob, you have the possibility to adjust the input signal level of 13 satellite – LNB inputs and the terrestrial 0-15 DB or customize each other. The short circuit proof heavy duty Stromsparnetzteil P3U27 also easily provides the simplest LNB. The Multiswitch is suitable for twin – Quad – Quattro LNB. If necessary you can extend at any time the above multi switch with one our cascade building blocks to further subscriber connections. HDTV / DVB-S 2 / full HD / SKY HD / 3D ready / 4 K UHD. Model: EMP-Centauri MS13 / 8PIU-6. Construction: 13 inputs / 8 outputs of the participants. Reception: 3 satellite, 1 aerial or cable DVB-C. Terrestrial active (gain): Yes. Sat-range active (gain): Yes. Control: DiSEqC 1.0 – 1.1 (2.0) commands. High performance Stromsparnetzteil: P. Suitable for digital (DVB-S): Yes. Suitable for HDTV (DVB-S2): Yes. Twin LNB eligible: Yes. Quad LNB compatible: Yes. Signal strength level control: Yes. Used as a cascade of degree: Yes. Frequency range SAT: 950 2300 MHz. Passive input: 5 862 MHz. Frequency range output active: 40 2300 MHz. Frequency range Terr Input Active: 40 862 MHz. Frequency range output passive: 5 2300 MHz. Loss satellite: avg 0dB. Loss terrestrial: 16dB avg. Decoupling V / H:> 20 dB. Decoupling Low / High:> 20 dB. Isolation sat inputs min. Maximum input signal satellite. Maximum output signal satellite: 85dBµV. Maximum output signal Terr. Power consumption of the receiver: 50 mA at 18V. + 70 ° C. Terrestrial input: 1 F-connector female. Input sat levels: 3 satellite positions = 12 F-female connectors. Receiver outputs: 8 F-female connectors. Short circuit protection: Yes. LNB power output: not specified. Electricity needs from the receiver: 75mA. Power consumption mode active / passive: 6.5 W / 4.5 W + LNB. Internal power supply: P3U27 18 / 12 / 5 V 1000 mA Max. Power supply: 90 265 V AC 50 / 60 Hz. Operating temperature: -30 + 70 ° C. Quality of the upper class Multiswitch! 1 x 13-08 multi switch EMP-Centauri ProFi class 4 x screws for wall mounting 4x plugs. 2 x f terminators. 21 x F-plug 7.00 mm. 1x invoice VAT on your name. Check out our other offers. If the offer includes batteries or rechargeable batteries and rechargeable batteries do not belong in household waste. As a consumer you are legally obliged to return used batteries and accumulators. If you wish to exercise the latter option, please send your old batteries postpaid to our address (see below). These signs can be found on batteries containing pollutants and batteries. IPTV & Kartina TV. Austria 13.0 0. Belgium 13.0 0. France 13.0 0. England 13.0 0. Italy 13.0 0. Payments to 14 clock be sent by us on the same day. 4 73110 Hattenhofen T: 0 7164 915 10 16 Inh. We will inform you about our products. Digital DVB-S / S2 Full HDTV UHD 4K Ready. The item “Pro Class EMP 13-8 Multiswitch Multiswitch 3 Satellite=8 Subscriber HD 4K” is in sale since Thursday, May 18, 2017. This item is in the category “Sound & Vision\TV Reception & Set-Top Boxes\Satellite Multiswitchers”. The seller is “sterndiscount” and is located in Göppingen Hattenhofen. This item can be shipped worldwide. Pro Class EMP 13-8 Multi Switch 3 Satellite = 8 Subscribers HD 4K. The description of this item has been automatically translated. Multiswitch full HDTV UHD 4 K. Quality of the upper class! With the EMP professional-class MS 13/4 PIÙ 6 of brand EMP-Centauri You can three satellites Positions Z. Astra 19.2 ° E + Hotbird 13,0 ° E + Turksat 42 ° E with up to 3 Quattro LNB Dine on the multi switch and up to eight participants / receivers Digital connect to the outputs of the multiswitch and supply. Participants can see your show independently from each other. The very low loss values and very good signal processing characterize the brand EMP Multiswitches. The EMP Multiswitch is terrestrial back-channel passive fit and it is possible to inject a terrestrial antenna (FM, DAB, DVB-T), cable channels (DVB-C) or monitoring cameras on the TERR input on the Multiswitch. With the knob, you have the possibility to adjust the input signal level of 13 satellite – LNB inputs and the terrestrial by 0-15 dB or customize each other. The short circuit proof high performance Stromsparnetzteil P provides the simplest LNB 3U27 without any problems. The Multiswitch is suitable for twin – Quad – Quattro LNB. If necessary you can extend at any time the above multi switch with one our cascade building blocks to further subscriber connections. HDTV / DVB-S 2 / full HD / SKY HD / 3D ready / 4 K UHD. Model: EMP-Centauri MS 13/8 PIU-6. Construction: 13 inputs / 8 outputs of the participants. Reception: 3 satellite, 1 aerial or cable DVB-C. Terrestrial active (gain): Yes. Sat-range active (gain): Yes. Control: DiSEqC 1.0 – 1.1 (2.0) commands. High performance Stromsparnetzteil: P. Suitable for digital (DVB-S): Yes. Suitable for HDTV (DVB-S2): Yes. Twin LNB eligible: Yes. Quad LNB compatible: Yes. Signal strength level control: Yes. Used as a cascade of degree: Yes. Frequency range SAT: 950 2300 MHz. Passive input: 5 862 MHz. Frequency range output active: 40 2300 MHz. Frequency range Terr Input Active: 40 862 MHz. Frequency range output passive: 5 2300 MHz. Loss satellite: avg 0dB. Loss terrestrial: 16dB avg. Decoupling V / H:> 20 dB. Decoupling Low / High:> 20 dB. Isolation sat inputs min. Maximum input signal satellite. 90dBµV / 100 dBµV. Maximum output signal satellite: 85dBµV. Maximum output signal Terr. Power consumption of the receiver: 50 mA at 18V. + 70 ° C. Terrestrial input: 1 F-connector female. Input sat levels: 3 satellite positions = 12 F-female connectors. Receiver outputs: 8 F-female connectors. Short circuit protection: Yes. LNB power output: not specified. Electricity needs from the receiver: 75mA. Power consumption mode active / passive: 6.5 W / 4.5 W + LNB. Power supply internal: P 3U27 18 / 12 / 5 V Max 100 0 mA. Power supply: 90 265 V AC 50/60 Hz. Operating temperature: -30 + 70 ° C. Quality of the upper class Multiswitch! 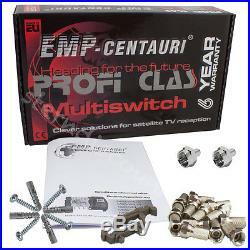 1 x 13-08 EMP-Centauri DiSEqC-switch professional of class 4 x screws for wall mounting 4x plugs. 2 x f terminators. 21 x F-plug 7.00 mm. 1x invoice VAT on your name. Check out our other offers. If the offer includes batteries or rechargeable batteries and rechargeable batteries do not belong in household waste. As a consumer you are legally obliged to return used batteries and accumulators. If you wish to exercise the latter option, please send your old batteries postpaid to our address (see below). These signs can be found on batteries containing pollutants and batteries. IPTV & Kartina TV. Austria 13.0 0. Belgium 13.0 0. France 13.0 0. England 13.0 0. Italy 13.0 0. Payments to 14 clock be sent by us on the same day. 4 73110 Hattenhofen T: 0 7164 915 10 16 Inh. VAT IdentNr: DE 254028388. We will inform you about our products. Digital DVB-S / S2 Full HDTV UHD 4K Ready. The item “Pro Class EMP 13-8 Multi Switch 3 Satellite = 8 Subscribers HD 4K” is in sale since Friday, February 24, 2017. This item is in the category “Sound & Vision\TV Reception & Set-Top Boxes\Satellite Multiswitchers”. The seller is “sterndiscount” and is located in Göppingen Hattenhofen. This item can be shipped worldwide.